Offering you a complete choice of products which include bluetooth scale. 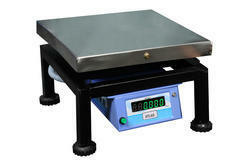 To meet the new trend technology we have developed electronic weighing scale with blue tooth technology. This scale can be connected to any CELL PHONE, TAB AND ANDROID DEVICES. Looking for PORTABLE SCALE ?